The Journal of Physical Chemistry A is a scientific journal which reports research on the chemistry of molecules - including their dynamics, spectroscopy, kinetics, structure, bonding, and quantum chemistry. It is published weekly by the American Chemical Society. 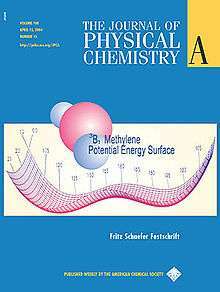 Prior to 1997 the title was simply Journal of Physical Chemistry. Owing to the ever-growing amount of research in the area, in 1997 the journal was split into Journal of Physical Chemistry A (molecular theoretical and experimental physical chemistry) and Journal of Physical Chemistry B (solid state, soft matter, liquids, etc.). Beginning in 2007, the latter underwent a further split, with Journal of Physical Chemistry C now being dedicated to the burgeoning fields of nanotechnology, molecular electronics, and related subjects. ↑ Schatz, G. C. (2005). "New Editor-in-Chief for The Journal of Physical Chemistry A and B". J. Phys. Chem. A. ACS Publications. 109 (1): 1. doi:10.1021/jp040657x.